March is turning out to be a fun-filled month of events that welcome you, your pets, and help other animals in need. If you’re looking for a concert, happy hour, or looking to adopt a new family member, many of the events listed below are sure to fill those needs. Not near any of these cities? Check with your local humane shelter or animal rescue org to see if there’s some pet-friendly events near you. 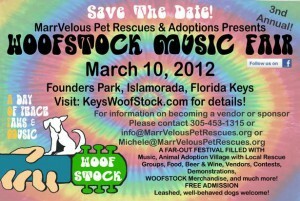 Woofstock: A Day of Peace, Paws, and Music is scheduled for March 10, 2012 from 11am to 7pm at Founders Park in Islamorada, Fl. Admission is free but there is a requested donation. The money raised will benefit Marrvelous Pet Rescues. Just as the name suggests, it is going to be a day of music, peace, and pups! There will be food, vendors, games, and music all day. The event will celebrate loving your pet as well as have some great educational booths and vendors. There will be pet rescue organizations there as well with some dogs looking for forever homes. Founders Park is located at 87000 Overseas Highway and for more information please call 305-453-1315. 3rd Annual Alabama Week for the Animals is from March 10 to March 18, 2012. From 7am to 7pm everyday is bringing together educators, advocates, leaders, and pet owners to promote and highlight the importance of animals in our lives. Admission is free and there will be pet adoption festivals, wildlife activities, community building events, and statewide awareness through various businesses and organizations. All the events will shine a spotlight on Alabama and the pets and animals that make life brighter. If you’re looking to see what specific events are being held near you, visit their website for more information: http://www.alabamaanimals.org. St. Pawtrick’s Day is being held in Rockville, MD at Dogtopia of Whiteflint located at 4920 Wyaconda Road on March 15, 2012 from 6pm to 8:30pm. Admission is $10 for individuals and $15 for couples. The Montgomery County Humane Society is throwing a St. Patrick’s Day after-hours part for you and your dogs! There will be an area for an off-leash romp, wine, beer, snacks, and a dj. It will be a great party for everyone. For more information call 240-401-8144.